Beautiful dwarf broadleaf evergreen provides exquisite fragrance in summer and is the jewel in the crown of the winter landscape. Highly perfumed Crown Jewel® Gardenia is an easy care, broadleaf evergreen hybrid in a versatile dwarf size and requires little if any pruning to stay in shape. This garden jewel grows about 6 inches per year with the potential to reach 2 or 2 ½ feet in height and a spread of 4 to 6 feet wide, ideal for garden beds. The plant is hardy to zone 6 and bright green evergreen foliage is medium to small-sized for the species, with a soft texture overall. Crown Jewel® Gardenia is the very best selection from a controlled cross between dwarf ‘Kleim’s Hardy’ (dwarf habit, heavy bloom set) and ‘Chuck Hayes’ (cold-hardiness, twice-blooming, double flowers) by Philip Dark of Oakmont Nursery in Chathem County, North Carolina. Dark is a member of the consortium of growers, breeders, retailers and marketers that make up Garden Debut®, and he reports that cold testing is ongoing in Zone 5. .
Crown Jewel® Gardenia prefers well drained, moist soil and full sun to partial shade (a bit of afternoon shade is great) and good air circulation. A cooler, woodsy environment protects from the harsh reflective heat of concrete or asphalt. Shelter from cold winter winds helps to prevent tip dieback at the colder edge of the plants’ range. Organic compost is excellent or light applications of commercial azalea fertilizer or diluted acid-forming fertilizers are good, although too much can burn tender roots. This genus is native to the tropical and subtropical regions of Africa, southern Asia, Australasia and Oceania. Gardenias are easily grown in the southeastern U.S. because they demand high humidity and rich, acidic soils to thrive. For more information on Crown Jewel® Gardenia PP19896 and other superior plant introductions from Garden Debut®, visit www.gardendebut.com. Best on moist, well-drained soils rich in organic matter. Follow a regular watering schedule during the first growing season while plants are getting established to promote a deep, extensive root system. Keep roots cool with a thick layer of organic mulch. Fully double, medium-sized, waxy white flowers, measuring 2-3 inches in diameter begin in early June with heavy bloom, and flower throughout the summer until frost. Flowers perfume the landscape with a sweet fragrance. 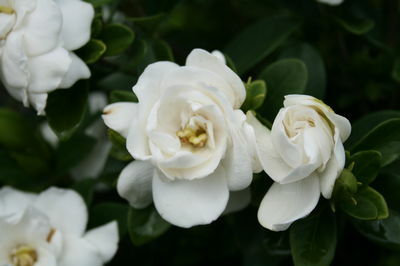 The natural fragrance of gardenia cannot be distillated and in perfumery, fragrances of orangeblossom, jasmine and tuberose are substituted for gardenia. Place near door, courtyard, patio, gate or entrance, in garden beds, along walkways or in containers on the deck, where handsome foliage and fragrant flowers may be enjoyed at close range. Fragrant flowers with thick white petals are traditional for corsages or hair ornaments, for cutting, to float in a bowl of water on the dining table. Bring into the greenhouse or home during winters in cold weather zones. When performance counts, use Garden Debut® introductions!